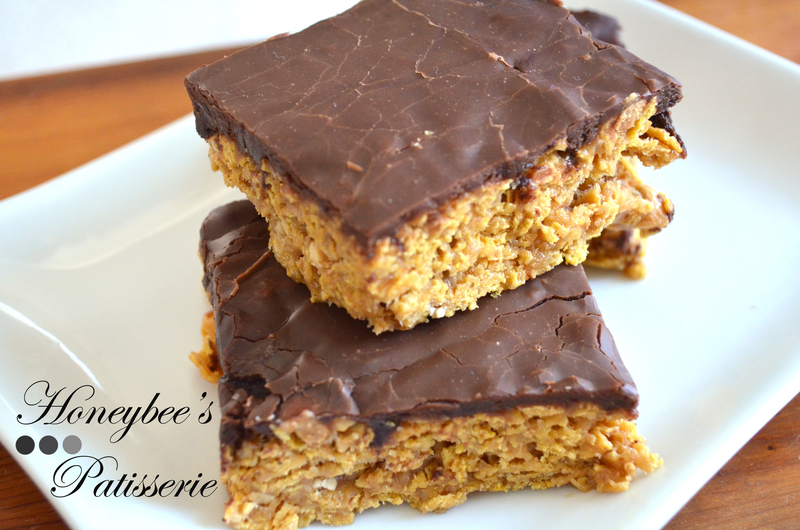 Anything that claims to be no-bake always catches my eye because it is synonymous with quick and easy, two words I enjoy hearing or reading. Being a stay at home mommy I am always looking for things that are quick and easy. Sure I stay home all day but that doesn’t mean I am full of free time. I am constantly doing homework for my college coursework as well as chasing around a very active 21 month old girl, all while trying to combat active Crohn’s Disease, which can sometimes make me want nothing to do with food for extended periods of time. Finding things that are no-bake fit perfectly into my schedule and I’m sure many others who have busy lifestyles. 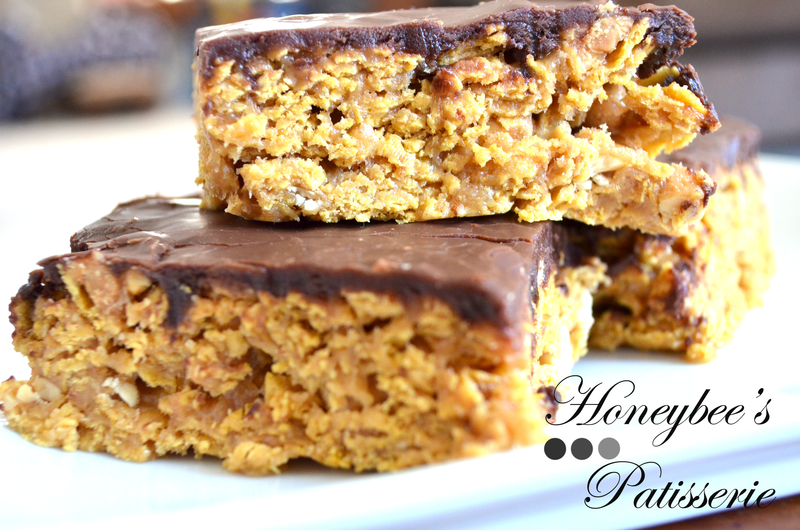 When I am craving something sweet, these bars are quick and take very few ingredients (with most ingredients being pantry mainstays) making them the perfect go-to treat. If all of that was not enough to entice you into trying these bars, the fact that they taste like a cross between a Rice Krispie Treat and a Baby Ruth should. Peanut lovers will rejoice at these bars that are full of peanut goodness. 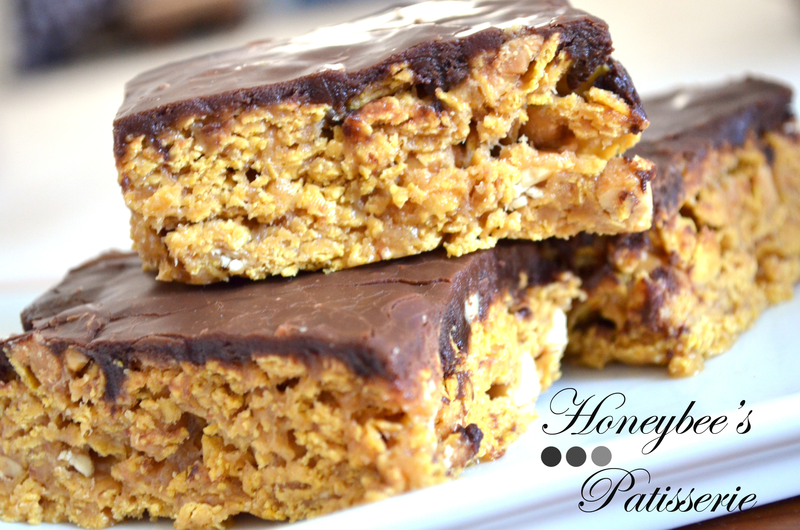 Not only do these bars use peanut butter but they are also filled with chopped peanuts, making them chewy, crunchy, and all around satisfying. Since these bars only require six ingredients and are rather simple to make there are not too many warnings to be concerned about. I think the biggest mistake people can make is not greasing the pan liberally enough because these bars are sticky and if you neglect the pan of the grease they need it will surely result in the bars sticking as you try to cut and remove them from the pan. Also be very cautious when melting the chocolate. Melt over a double boiler stirring constantly making sure the water does not touch the bottom of the top pan or melt in a microwave. If you choose to melt in the microwave, do very short intervals and stir a lot to make sure the chocolate melts evenly and does not get overcooked and separate. Note: The following makes approximately 24 bars. Store in an airtight container. Bars are best consumed within 2 days of being prepared. Grease a 13×9 inch baking pan very well (I used nonstick cooking spray). In a large pot, bring sugar and corn syrup to a simmer. Remove the pan from the heat and mix in the peanut butter and chopped peanuts, stirring until the mixture becomes smooth. Add the cornflakes and gently stir until the peanut butter mixture is evenly distributed (there should not be any dry cornflakes). Place the mixture into the greased pan and press evenly across the pan and into the corners with a greased spatula. Drizzle the melted chocolate over the bars and spread evenly with an offset spatula to cover the entire surface (bars should not show from underneath the chocolate). Allow the bars to cool completely and chocolate to set, approximately 30 minutes. Slice to desired size and serve.